Waking up in the bottom of the deepest canyon in North America is wondrous. Before the sun peaks over the towering canyon walls in Hells Canyon, the smell of coffee brewing floats into the tent on the warm morning air. 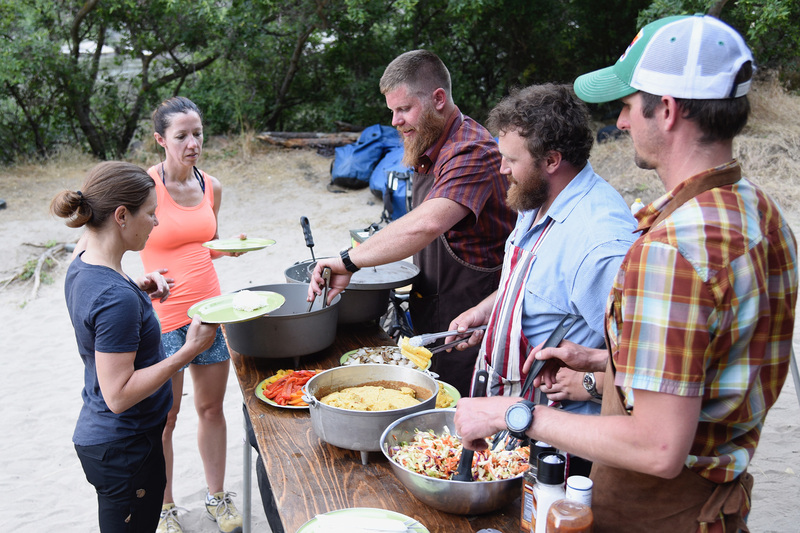 After rolling off the cushy sleeping pad and out of the warm sleeping bag, you make your way down the sandy path to the river kitchen. There waiting is the largest pot of coffee you’ve ever seen and some fresh Idaho fruit to nibble on. Other early risers sit in the riverside dining room all staring at the opposite canyon wall, hopefully searching for the white fur of a mountain goat and it’s baby to pop their heads out of the dark lava rocks. A break from phones and internet feels great while getting a chance to spend time with friends and family. With the smell of bacon wafting in the air, breakfast is served: banana bread french toast, real maple syrup, thick crispy bacon, scrambled eggs, yogurt and homemade granola. The sun breaks over the canyon wall and the day immediately starts to heat up. 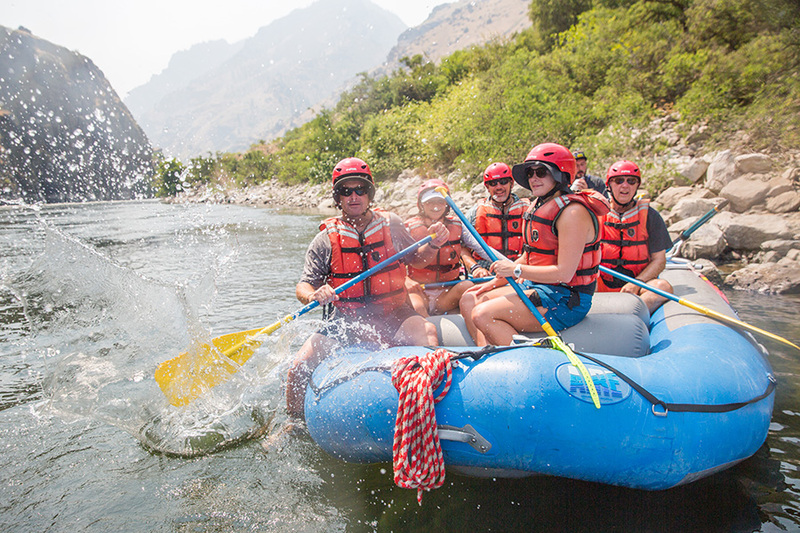 It’s time to get rafting on the Snake River. 8000 feet below the peaks of the Seven Devils and Blue Mountains, the rafts float the wide river for long stretches of calm meandering water leading to Class II-IV rapids with big splashy rowdy waves. 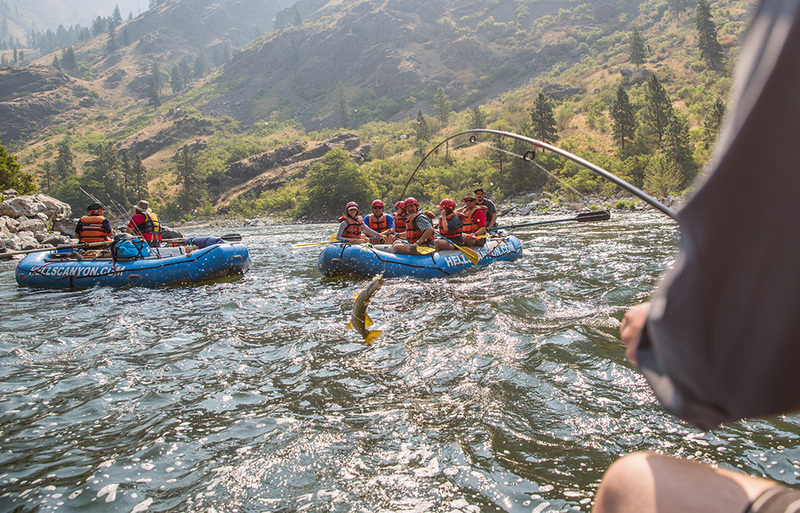 Fishermen (and fisher kids) pluck smallmouth bass and trout out of the Snake River with excitement. Lore of 8…10…12 foot toothless dinosaur fish called sturgeon is told as your guide gets ready to drop a line that looks like it’s ready to pull in a small whale. Jokes and laughter fill the boat until the whizz of the fishing line and pulling of the boat catch attention. Someone grabs the rod and starts reeling it in until you can just see the outline of the huge fish below the water. It whips it’s massive body around and just like that it’s off the line and swimming back down into the depths of the river. The sturgeon made off with the bait, but there are plenty more holes to fish downriver. The day heats up quickly and the cool river water feels extremely refreshing while swimming, splashing and kayaking. The guides row the rafts to shore and lead a hike to pictographs painted by people thousands of years ago and remains of old homesteads from the early 1900’s. Back at the riverside beach, lunch is waiting: freshly baked croissants, chicken salad, homemade asian noodle salad, warm gooey cookies, chips and cold drinks. Everyone parks themselves in the shade to eat. After lunch the rafting, swimming, kayaking, and fishing continues until the familiar blue raft at shore is visible, signaling you’ve arrived at camp. Now there’s plenty of time to relax: swim, bathe, read a book, take a nap, fish, play beach games or just pull up a chair with your toes in the sand. Next thing you know, there’s warm baked brie with grapes beside you and an offer for tonight’s specialty cocktail: fresh margaritas. Dinner is served a little while later: pineapple BBQ chicken with grilled pineapple, peppers and onions, coconut rice, salad, and hot freshly baked cornbread. Everyone enjoys dinner family style in the riverside dining room sharing stories and laughs from their day. A warm chocolate cake appears out of a Dutch Oven served with berries and whipped cream. The day feels full and long, and bed is enticing. The Idaho sky above is crystal clear and chock full of thousands of stars. The view is just too good to miss, so the sleeping pad gets pulled out of the tent, and you cozy up in your sleeping bag, trying to keep your eyes open to look at the stars as long as possible, knowing tomorrow will be another great day rafting on the Snake River. From scratch delicious restaurant quality food served riverside: pineapple BBQ chicken, hot fresh cornbread, grilled vegetables, and cole slaw. America’s Rafting Company offers 3, 4 & 5 Day Whitewater Rafting Trips in Hells Canyon from May through September. To learn more, check out the Hells Canyon Rafting Trip details here or give us a call at (208)347-3862. 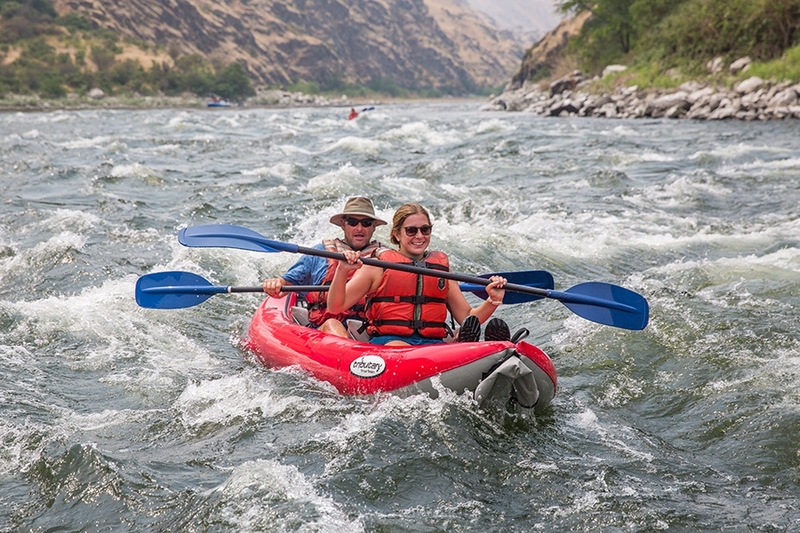 A day in the life of whitewater rafting in the bottom of Hells Canyon in Idaho and Oregon.